Scottish Premiership: is Sam Cosgrove one of the best strikers? If you were to ask anyone outside of Scotland to name a handful of strikers that play in the Scottish Premiership, you would more than likely hear names tied to two of the biggest clubs in the country: Celtic & Rangers. Whether it be the strength and speed of Odsonne Édouard or the vast amount of goals that Alfredo Morelos puts away, the fact is that a player outside of Scotland’s big two hardly gets any recognition. Sam Cosgrove signed for Aberdeen on deadline day in January 2018 for free from English League Two side Carlisle United. Born in Beverly, Cosgrove would struggle to find game time at any of the clubs he applied his trade at. His career began at Wigan, but he would never get a chance to play for the Latics, instead he went out on loan to three different clubs across the country during the next two years, playing a total of 19 games in that amount of time and seeing no success in front of goal. Things wouldn’t get any better for the Englishman when he signed for Carlisle in the summer of 2017, as he made a mere eight appearances for the club before finally moving up north to the Granite City. 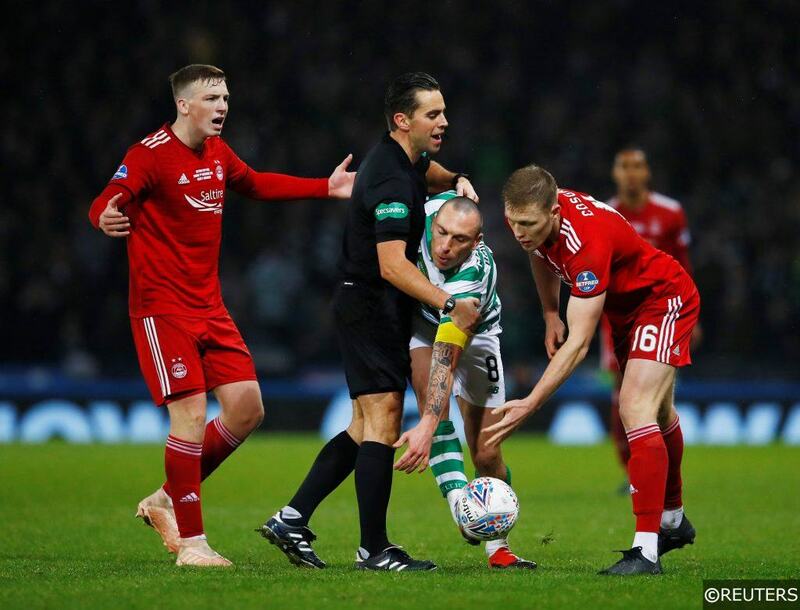 However, the then 21-year-old would have to wait almost a month before debuting for his new club, coming on as a substitute in the 76th minute when the Dons were already 2-0 down against Celtic. Cosgrove didn’t score, but he was sent off just eight minutes into his debut. The Englishman would only play eight more times for the remainder of the season and failed to score a single goal. Not the dream start for a striker. The 2018/2019 season still saw Cosgrove struggle for goals in all the competitions Aberdeen played in. But finally, nearly ten months and over 20 appearances later, he scored a double in the Dons’ 4-1 over St Mirren, as the striker opened and closed the scoring for his side. However, he wasn’t quite out of the woods yet. Another goal drought followed the youngster, failing to convert any chances during his next eight games and seeing yet another red card when he picked up his second yellow in a crucial 1-0 win over Rangers, ensuring that he missed Aberdeen’s fixture against St Johnstone. Cosgrove’s next appearance against Livingston would be less than a week after being sent off. The Beverly native scored a crucial goal to bring the Dons level in a match that they would eventually go on to win, raising his confidence for the coming weeks. Cosgrove would go on to score a whopping six goals in the next four games, including one in his side’s 2-1 win over St Mirren, two doubles against Dundee and then Hearts, as well as contributing in the Dons’ 4-3 loss to Celtic on Boxing Day. Although he wouldn’t get his name on the scoresheet for the last game of the year against Livingston, his performances were enough for him to be awarded the Premiership Player of the Month for December, alongside his manager Derek McInnes, who was named Manager of the Month. Cosgrove didn’t stop in the new year and he has been on fire so far, scoring seven goals in just seven matches, bagging a hat-trick of doubles against Hamilton, Rangers and Queen of the South, as well as another goal in Aberdeen’s 4-1 win over Stenhousemuir. The striker has exploded onto the Scottish football scene in style, as his tally for the last 13 games he’s played in sits at 14 goals, and 16 goals for the overall season. Aberdeen desperately needed a prolific goalscorer to fill the gap that Adam Rooney left when he moved down south, and Cosgrove seems to be the man for the job. Only time will tell whether the Englishman has what it takes to continue on his goalscoring spree, and if he’s capable of managing it then he has the potential to become one of the best strikers in the country- and he could also raise the attention of bigger & more powerful clubs, even if he has just signed a contract extension with the Dons. Cosgrove currently lags behind Alfredo Morelos by two goals in the Scottish Premiership goalscoring charts but is sitting some four goals ahead of James Tavernier in 3rd place. Cosgrove also has the best goals to minutes ratio in the division, and with Morelos picking up yet another suspension last time out there’s every chance of Cosgrove making a claim for the top award. That, and the fact that bet365 pays out 1/3 odds on the top two scorers on eachway bets, makes this a fantastic option to back this season. Categories: Blog, Football, and Free Tips. Tags: Aberdeen, cosgrove, Derek McInnes, sam cosgrove, Scotland, Scottish Premiership, and spfl. Team Tag: aberdeen, Carlisle United, celtic, rangers, and Wigan. League: Scottish Premiership. Sports: Football.